2008 studio album by P.O.D. 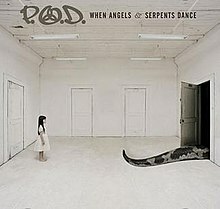 When Angels & Serpents Dance is the seventh studio album by Californian metal group P.O.D., released in 2008. It is the first album to include Marcos Curiel since Satellite and the first and only album to be released by INO/Columbia. It also includes Mike Muir from Suicidal Tendencies, Helmet guitarist/vocalist Page Hamilton, guest Gospel Choir, and the Marley Sisters. The album debuted at number 9 on the Billboard 200, selling over 34,000 copies in its first week. It has sold over 200,000 copies worldwide so far. On June 1, 2007, at the ROCKBOX in San Diego, the band performed and revealed a new song entitled "Condescending", along with another new song performed on June 16, 2007, at the Journeys Backyard BBQ tour entitled "Addicted". They also revealed the title of their new album to be When Angels & Serpents Dance. On August 4, 2007 the band played at Angel Stadium of Anaheim's annual Harvest Crusade where they revealed a new song entitled "I'll Be Ready" for a crowd of 42,000, the largest number in attendance for the three-day event. On December 1, P.O.D. posted a blog on their MySpace that they had set up a "secret" website to reveal pieces of the cover to the public from December 3 - December 10. P.O.D. also posted the lyrics to one of their songs on the "secret" website. They are as follows: "One must lead in the dance. Who's leading you? Life is real when angels and serpents dance." In the early morning of December 10, 2007, in addition to the unveiling of the final pieces of the album cover, it was officially announced on P.O.D. 's "secret website" that When Angels & Serpents Dance would be released on April 8, 2008. For the better part of 2007, payableondeath.com, the main website for P.O.D., featured only a picture of the band with Marcos from the 2002 Still Payin' Dues DVD photoshoot, and a 30-second advertisement for Greatest Hits: The Atlantic Years. In a mass e-mail sent out in mid-December, the band announced that in conjunction with the 2008 New Year, a new website would be launched with an exclusive track from When Angels & Serpents Dance. On January 1, 2008, the website was updated and shows a video with a 30-second preview of the song "When Angels & Serpents Dance". On January 25, 2008, a free download of the band's title song "When Angels & Serpents Dance" became available to the public. "Addicted" is used in the video game, WWE SmackDown vs. Raw 2009. "Condescending" is used in the video game, NASCAR 09. ^ Blabbermouth Staff report (2008-01-02). "P.O.D. To Release New Album In April". Blabbermouth. Retrieved 2008-01-02. Spiritual rockers P.O.D. (a.k.a. PAYABLE ON DEATH) will release their new album, "When Angels & Serpents Dance", on April 8 via INO/Columbia Records. ^ Blabbermouth Staff report (2007-08-30). "P.O.D. Taps Producer Jay Baumgardner For New Album". Blabbermouth. Retrieved 2007-10-30. Spiritual rockers P.O.D. (a.k.a. PAYABLE ON DEATH) have tapped Jay Baumgardner to produce and mix their new record, "When Angels and Serpents Dance", set for release early next year on INO/Columbia Records. ^ Peters, Mitchell (2008-02-04). "Founding P.O.D. Member Re-Joins For 'Angelic' Effort". Billboard. Retrieved 2008-02-04. The forthcoming album, the band's first since 2006's "Testify," also features guest appearances from the Marley Sisters, Suicidal Tendencies singer Mike Muir, Helmet guitarist Paige Hamilton, and a gospel choir on "End Of The World". ^ "Who Charted: Leona Lewis' Spooky Gaze Hypnotizes 205,000 Americans Into Buying Her Album". Web.archive.org. Archived from the original on May 12, 2008. Retrieved 2013-04-22. ^ Laurie, Greg (2007-08-06). "Saturday had the largest crowd from the three days". Harvest Crusades. Retrieved 2007-12-04. Music lent support to the talks presented by Laurie each night at the Harvest Crusade, reinforcing the message of God's love. From raucous hip-hop and rock from multi-platinum band P.O.D., to lively pop-infused music and dance steps from tobyMac, to an audience sing-a-long with the David Crowder Band, the Christian music represented at the crusade kept audiences on their feet. ^ Blabbermouth Staff Writer (2008-01-25). "New Song Available For Free Download". Blabbermouth. Roadrunner Records. Retrieved 2008-01-26. A new P.O.D. (a.k.a. PAYABLE ON DEATH) track, entitled "When Angels & Serpents Dance", is available for free download. "Rock the Party (Off the Hook)"
This page was last edited on 14 February 2019, at 12:01 (UTC).